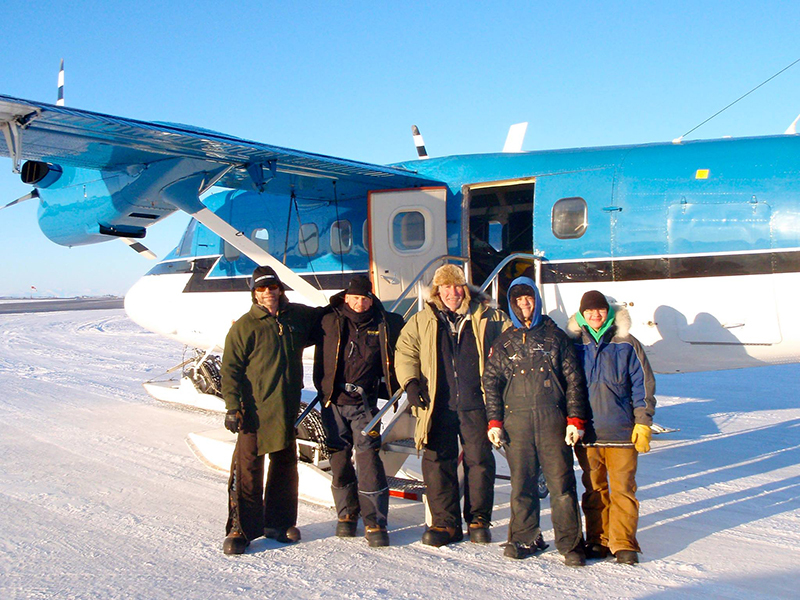 The first flight flew to Herschel island at about midday. When we arrived there were very high winds and it was very cold – the snow was airborne about waist height. So we picketed the dogs straight away, unloaded the aircraft and it took off again. Then the first thing we had to do was to re-stake out the dogs round the back of the building out of the wind, to allow space for the dogs coming in on the next flight. The 2nd flight out had a mechanical problem and couldn’t get back in till about 6pm by which time the wind had dropped a bit so we managed to feed the dogs and get the place warm, so that was all a big relief. Strong breeze, sunny clear sky and we sledged all the way down the side of Herschel Island and Pauline Cove, into the channel between the mainland & HI and along the sea ice, 15 miles to the delta. We kept drifting a bit far west and lost a couple of miles. Pretty nasty overflow through the shallows which means running water on top of the ice, this freezes onto the rails of the sledge and onto the dogs legs so each time we run through it we have to stop, hack the ice off the sledge with an axe, try and get the dogs as free from the ice as possible and keep going. If we hit another slushy patch we have to repeat the whole manoeuvre. Monday night we camped in the open. The wind dropped in the night but it snowed all day till about 3.00pm, visibility was very poor. We set off and I used a compass bearing to correct our direction to get to the Firth mouth. It is always a bit hairy just going on a compass bearing, as you don’t know where you are, but anyway we found the mouth of the Firth and just as we could see it in the distance Graham’s sledge handle broke, that took ½ an hour to fix. We had a good run on frozen overflow and glare ice (hard ice) the dogs sliding around and the sledges all over the place, but then we hit some really bad overflow for 2 hours, up to our knees in water. My sledge got turned over into the water, everything got wet but we managed to move on through the overflow and then we camped about 20 mins later by the side of the river which was a slightly elevated point a couple of feet above it. The overflow was coming down river as well and was creeping towards us getting to within 1 ½ m of our camp and dogs! Cold, wet and very miserable, everything soaking, we had no fire or water. Clear and sunny but as we were in a canyon the sun didn’t come through till later. We had to wait all day for the overflow up river to freeze so that we could run on it and we couldn’t go back because of the overflow below us. We had a miserable time, very cold camping in an open area with no shelter and everything was still wet with no chance of drying anything. We set off, it takes about 3 hours to break camp. We came across a lot of hollow ice, then we had a very good run on flat ice to Sheeps Creek, the ice breaking, cracking and groaning under us was a bit alarming! The hollow ice is a real problem, it is where there is a hole in the ice to the running river and rapids underneath, it took us 3 hours to get through. We had been wet since Tuesday and by Thursday, after three very hard days, we were exhausted and dangerously cold. We had a beautiful run down to Sheeps Creek where there is a rangers hut. Our boots and clothes were still soaking wet so we stayed here for 24 hours to dry out. The only heat we had in the hut was our little Primus stoves which heat the water for our food and drink, and for the dogs. The boots took a whole night to unfreeze. You have to hold the frozen boot over the Primus stove for five mins just to be able to melt the ice enough to get the liner out. We used bin liners over our socks to keep them reasonably dry. Sheeps Creek is staggering beautiful. Suddenly the dogs started howling then stopped and across the valley wolves howled back. We will head out 50 miles to the border, feeling very positive. Have now got 2 sets of dry clothes, one on us and one in the bag. It should be 3 1/2 days to the Alaska/Canada border. Been hell getting this far but we knew this part of the trail would be very difficult. Hi my name is Hector and I am a student at MC. Just to say good luck and to ask you what motivates you to wake get dressed and trek through Canada and Alaska. we have just started learning about your expedition. How long do you think the whole expedition will take you? Good Luck!!!!! Mr Oakley will not be able to answer any questions during the expedition but I can direct you to the Expedition video http://inamundsensfootsteps.com/expedition-video/ which should provide you with some of your answers. I am sure he will answer all your questions on his return and very much values your interest in his expedition. It will be very close to the end of March before the team makes it into Eagle. Hi Tim, I saw Amundsen was wearing animal skins when he travelled to the north pole and I was wondering what sort of clothing you and all your team are wearing to protect you from the extreme weather conditions. Really good luck from Me and all of Marlborough College with the rest of your journey. The team members have spent many years testing different clothing and have gathered the best gear they can that will keep them warm. Down parkas with good fur ruffs to block out the wind and cold. Good sturdy bibs that can handle rough abuse. The inner clothing needs to be able to wick moisture. They all have good gloves and mitts to keep their hands warm. Hello Mr Oakley, I hope your expedition is going well. I would just like to ask what climatic condition is best for distance to travel. Hi Harry, The climate best suited for travel with dogs is a temperature range between minus 10 and 10 above F. That gives the team members a comfort range and the dogs are not too hot. In these temperatures the ice holds well and there is hopefully not too much overflow. Overflow happens when the creeks freeze to the bottom and the water that is flowing is then forced over the top of the ice. This can happen in extremely cold temps and really warm temps. Mr Oakley will not be able to view these questions until after the expedition. 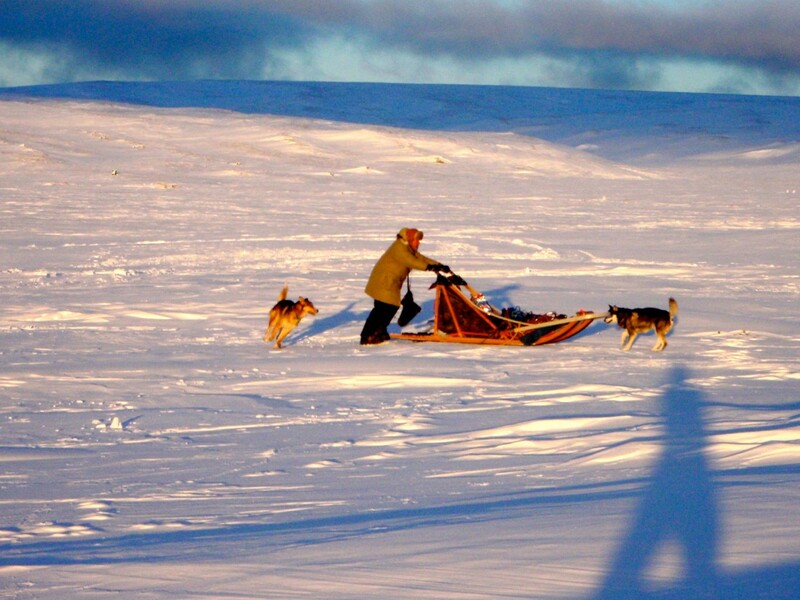 They travel with a sled repair kit that has certain items in it to where they would be able to make necessary repairs. Hi Tim, I was wondering how you manage to reply to all these message while you are on your journey. Do you have a solar panel charger and how do you do it in the harsh conditions? I am afraid that none of the questions can be answered during the expedition. Tim does have a satellite phone and tracking device with him which allows us to receive tracking information and when possible he telephones through diary updates that we then write up for the blog. There is no means by which he is able to answer the question on the blog until his return however I have updated the gallery with some new images that were taken on his arrival in Herschel Island. Hello Mr Oakley Do you let yourself become attached to any of the dogs? The dogs are very easy to get attached to as they are friendly, wonderful, hard working animals. There is no reason not to become attached to the dogs. Every one of the 22 dogs will be home soon and enjoy a lot of loving attention. Hi Jemima, All the dogs have names and yes, if it were not for these wonderful dogs the men of the expedition would be in a lot of trouble. The dogs have been great and are a very important part of the team. Dear Mr Oakley How do you charge all your equipment with no electricity. Good luck and keep going. Mr Oakley has some energy packs with him along with a solar charger if there is enough sun out to utilize it. Mr Oakley is not able to respond or even view the questions until after the expedition. At that time he will do a detailed report on his findings and will answer questions then. Well done Tim and troupe - really hope the worst is behind you now and the rest of the trip will allow you to concentrate on the spectacular nature of your frozen surroundings! Glad to hear you have dry clothes again. May your clothes stay warm; your food hot and plentiful; and the sights you are seeing be amazing. Good luck! Best, Tom. Wow! Wow! and Wow! The Firth River Canyon below Sheep Creek, in Winter! Lots of lessons learned I'm sure. Sheep Creek sanctuary must have been much appreciated. Good going for the dogs and yourselves! Any sign of wildlife other than Wolves? Gwitchin First Nations from crow Flats used to come to the aufeis areas above Summit Lake to fish Arctic Char in the old days. Any sign of other human use of the area? Any sign of trapping along the Coleen River? A wonderful adventure whether by Roald and yourselves. Best cheers! The team have seen wolves and musk ox. There were no signs of other humans along the Firth but there are signs of trapping along the Coleen. Congratulations to the team for making it to the border. Hope you've all thawed out properly now. We're so enjoying following your progress from our armchairs in Newcastle! There have been no dangerous encounters with animals but there have been many dangerous, life threatening situations while traveling along the Firth. Mr Oakley has mentioned some of the difficulties in his blog. Dangerous ice, wet conditions, no way to dry out with temperatures as low as minus 40 F/C have all played into survival situations for the team and dogs. Dear Mr Oakley, We are students at MC and we were wondering where you got your dogs from. They look like a real part of the team. Good luck with the rest of your journey!